Shrieking pile of bubbling Void crabs, Donald Trump, revealed today that he has been using an embarrassment machine during the days leading up to his presidency. This revelation comes amid questions about his uncanny ability to do the stupidest and most embarrassing thing possible at any given time. While some had suggested dark magic from The Void was afoot, others pointed out that dark magic isn’t necessarily embarrassing, just evil. Creation of the machine has been happening in secret over the last several months, using raw footage and data of Trump’s already embarrassing business ventures, like Trump University, Trump Zoo, and Trump Tickles. 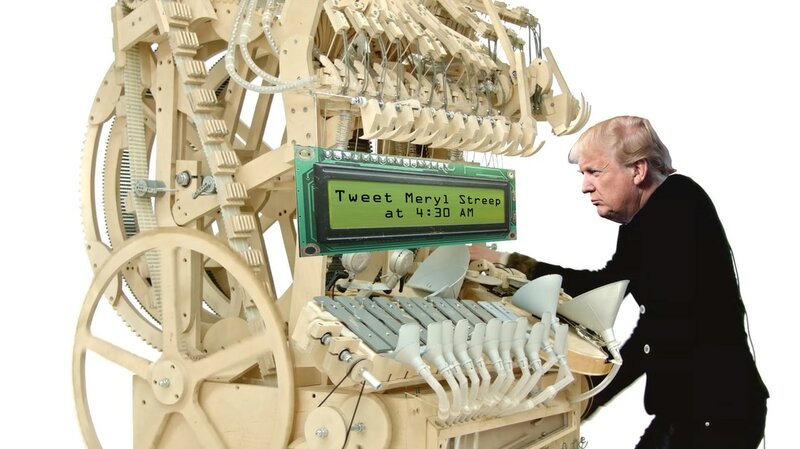 The machine is said to generate tweets and speeches that take the horrific Void beast’s inane ramblings and amplify them into fever-dreams of shocking immaturity, the type of thing that could make even the most explicit erotica authors cringe with secondhand embarrassment. The machine recently tweeted about Meryl Steep, but due to health concerns the 140 character message was too embarrassing to read in its entirety.